While most of our positions are in companies in the traditional real estate and infrastructure sector, we are also able to make investments in real estate technology companies. One company that earned our interest was Updater (UPD), a company solving a real problem that we could relate to. These positions are small to reflect the risks involved, but we think worthwhile given the potential returns for our investors. At Newgate we take a sceptical view on many of the business models supporting technology companies. When we look at emerging companies, we need to see several conditions satisfied to warrant an investment. Whilst prohibitive, we believe that the hurdle must be high to appropriately reward the Fund for the risk taken. Updater is a platform that helps Americans simplify the effort involved in moving from one house to another. It benefits both the real estate agent and the mover, allowing both to centralise and easily complete all tasks associated with the move. It’s estimated that there are 17 million annual household relocations in the US. The average American may move between 10-15 times over their life. We first became aware of Updater around its initial public offering early last year. What immediately interested us was the ambitious growth target the company had set, what they had already achieved, and what the future potential was in a market such as the US. At the time of IPO, Updater was processing around 2% of all moves in the US. In less than two years, the company is now processing over 11% of all moves. We like this proven growth, and that it is in the US market, the largest and the most attractive market in the world. But if it's free, how do Updater make money? While the platform is free to use, the business model is around helping companies gain access to the Updater platform to sell goods and services to movers. Central to the Updater investment case is the fact that people tend to make large spending decisions around the time of moving. This can include physical purchases such as furniture, fittings and electronics, as well as services such as cable TV, utilities and insurance. The largest providers of these services spend hundreds of millions trying to limit customers leaving them when they move, and trying to acquire new customers. For example, it is estimated that Liberty Mutual, a large US insurer, has a marketing budget of US $500 million per annum. However, these companies have no way of reaching the customer at this key decision making point. They often only out find a customer has moved after they have moved. Until now. Over the last year, Updater has signed pilot programs with the largest US companies in several industries - Insurance (Liberty Mutual), Banking (Capital One), Moving Services (several of the best including Hilldup and Ace Relocation) and Communications (AT&T). Their intent was to prove the value of the Updater platform to these major companies. The first two pilot results have been extremely positive, proving that the Updater platform works very well in acquiring customers for these large organisations. If we look further out. What could Updater be worth? We believe that if Updater continues its success, there is no reason that it cannot become the de-facto software product that facilitates moving. Companies like Uber, Airbnb and Google have become synonymous with travel, accommodation and search, where they have a dominant market position. In our view, there is nothing to stop Updater from having a dominant position in the US moving industry. At the current rate of growth, in two years’ time Updater could easily be processing 30% of all US household moves. To provide an example of the earnings power of Updater, we will undertake some scenario analysis on the value creation in home and casualty insurance. 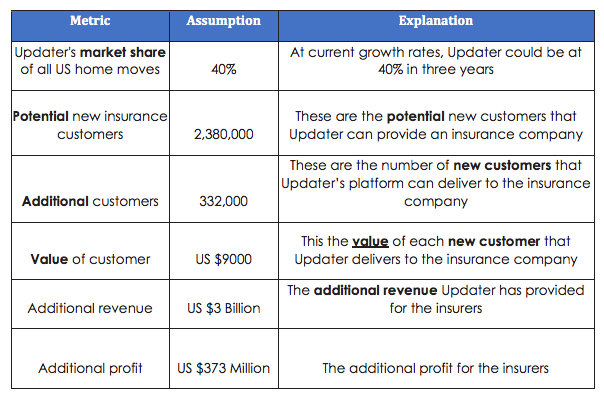 This analysis suggests that Updater can deliver $US 373 million of profit to the insurer. If we assume Updater takes 30% of this value created, that is revenue to Updater of AUD $140 million. Assuming a 50% margin on this revenue, profit to Updater is $70 million. If we put this on a market multiple of 17 times, this represents a market capitalisation of A$1.2 billion, or $2.52 per share. This compares to the current Updater share price of $0.98 per share. We have reviewed the value of just one vertical, there are many more. We have highlighted the value from Updater successfully executing in one industry. Clearly the upside is even more significant if they are successful in emulating in other industry verticals.